Essex County, New Jersey is committed to meeting the transportation needs of all its residents. Almost 20 years ago, the County documented several major gaps in the transportation network for lower-income workers. One critical need identified was for improved transit access to jobs at Newark Liberty International Airport, especially between the hours of 1:00 and 5:00 a.m. when transit did not typically operate. Not addressing this issue potentially jeopardizes the employment of many people who work at the airport and depend on public transportation. The potential solution proposed was a door-to-door service using smaller vehicles to take people from their homes in Newark and nearby communities to Newark Penn Station where there is all night service on the #62 bus to the airport and the PATH Train to New York City. In 2004, EZ Ride launched the service. Over the last 10-years, the fleet size has doubled from four to eight vehicles and ridership has more than tripled. The Essex County Division of Training and Employment runs programs that provide education and training, job placement assistance and other services for county residents. The agency works with the Division of Welfare, and the New Jersey Department of Labor and Workforce Development to provide its clients with essential services and opportunities to enable them to find good-paying jobs. Essex County, New Jersey is committed to meeting the transportation needs of all its residents. Almost 20 years ago, the County documented several major gaps in the transportation network for lower-income workers. One critical need identified was for improved transit access to jobs at Newark Liberty International Airport, especially between the hours of 1:00 and 5:00 a.m. when transit did not typically operate. Not addressing this issue potentially jeopardizes the employment of many people who work at the airport and depend on public transportation. The potential solution proposed was a door-to-door service using smaller vehicles to take people from their homes in Newark and nearby communities to Newark Penn Station where there is all night service on the #62 bus to the airport and the PATH Train to New York City. 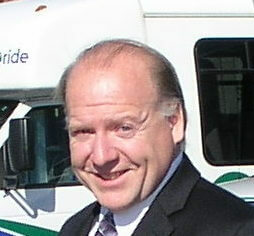 In 2004, EZ Ride launched the service. Over the last 10-years, the fleet size has increased from four to eight vehicles and ridership has tripled. Essex County is in northeast New Jersey, covers 130 square miles and has a population of almost 800,000. The county is a mix of urban and suburban communities and Newark is the county seat and largest city. As part of its overall process for planning for the future, Essex County developed a Community Transportation Plan that included profiling transit-dependent populations, examining the location of employment opportunities and identifying transportation service gaps. The plan also made concrete recommendations on how to improve the transportation network in the county, with an emphasis on establishing programs to facilitate commuting for lower-income workers. Nearly 24,000 people work at Newark Liberty International Airport, located in Essex and Union Counties. Newark Penn Station is about three miles from the airport and is a regional transportation hub with light rail, bus, and commuter rail services. NJ Transit’s #62 bus runs between the station and Newark Airport around the clock as does the PATH train to New York City. However, local buses do not operate between 1:00 a.m. and 5:00 a.m. This means that although the airport and New York City are accessible from Newark Penn station 24 hours a day, people working late-night or early-morning shifts who depend on public transit have difficulty commuting between Penn Station and their homes during these times. EZ Ride’s Essex Night Owl Shuttle moves commuters between their homes and Newark Penn Station, one of the largest transit hubs in the region; median ridership has grown from 40 riders in 2004 to the current 250+ riders every night. The service operates seven days a week from 1:00 a.m. until 5:00 a.m. and fills a critical need for night-shift workers who need a link to public transportation. The shuttle picks up riders in front of their homes in Newark, Orange, East Orange and Irvington and brings them to Newark Penn Station, where they can catch various trains or buses. Many Night Owl riders work at Newark Liberty International Airport and use this service to connect to the NJ Transit bus #62 that runs all night from Penn Station to the airport. The EZ Ride Night Owl drivers are extremely knowledgeable about the neighborhoods they serve. As riders board the bus at Penn Station and tell the driver their destination, the driver must devise the most efficient route to drop them off, pick up other riders at their homes and still get back to the station every hour.